We are proud to announce that George H. LaBarre Galleries, Inc. will be offering a wide range of PASS-CO certified items in their well-known and widely distributed catalogs. PASS-CO is honored to have been chosen to authenticate, encapsulate and grade the only known Liberty Loan bond with a starred serial number. Purchased by a private dealer, this extreme rarity was the subject of a recent cover story in the Bank Note Reporter and will be featured in a soon to be published catalog devoted to large size star notes. In response to the growing demand among PASS-CO customers for the grading and encapsulation of early American currency and fiscal paper, we are pleased to announce the expansion of our production staff under the direction of Diane Cotran. With the guidance of Ms. Cotran, PASS-CO staff can ensure the timely turn-around times, professional service and high standards that PASS-CO's customers have come to expect will be consistently maintained as orders continue to increase. PASS-CO is pleased to unveil an industry unique census of stocks and bonds signed by historic personalities. Developed by the nation's leading expert over the last twenty-five years, this valuable resource is unparalleled. 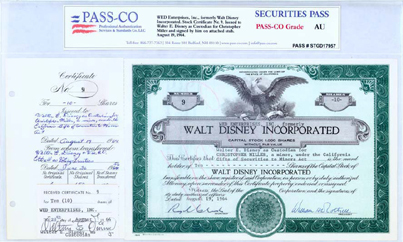 Upon submission and certification by PASS-CO, your certified stocks and bonds will be included in this database, providing you with the unique ability to determine the relative rarity of your item. Richard Bond, one of the nation’s most highly regarded authenticators of sports autographs and game used items, joins PASS-CO’s staff. An active figure in the sports memorabilia field for over a quarter of a century, Mr. Bond has worked as Director of Acquisition for one of the nation’s leading sports collectibles auction houses and was recently the grand prize winner at the first World Series of Autograph Authentication. Having handled millions of dollars in rare sports autographs and artifacts, Mr. Bond brings with him a wealth expertise and insight that will undoubtedly prove invaluable to PASS-CO’s clients. Two prominent long time historical autograph specialists, Gerard A. J. Stodolski and Scott J. Winslow both of Bedford New Hampshire, are pleased to announce the formation of PASS-CO the Professional Authentication Services & Standards Co., L.L.C. Just a short 50 mile drive from Boston, Massachusetts, PASS-CO provides professional authentications for historical autographs, documents, manuscripts photography and a variety of other historical collectibles. 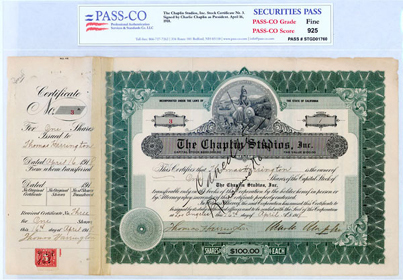 Additionally, the company will provide grading, authentication and encapsulation services for historical stocks and bonds. Forgeries and altered items have long been a problem for collectors of historical items. In recent years the problem has reached critical proportions. With the enormous explosion of the internet, sellers of spurious items now have an easy platform to offer their wares to an unsuspecting public worldwide. The volume of forgeries and altered items has reached frightening levels in recent years, said Winslow. After speaking with Gerard we both felt compelled to be pro-active in the marketplace by providing the general public with a truly professional level of authentication and grading services for historical documents. “We are thrilled to bring our collective expertise and experience to the marketplace in order to assist collectors in the development of fine collections throughout the world,” says Stodolski. Indeed, the two dealers have over 50 years of combined experience in the areas of historical autographs, manuscripts, documents, and other collectibles. Stodolski has been called upon to authenticate and appraise such important American documents as Lincoln ’s House Divided speech for the Morgan Library. When the New York Stock Exchange needed their archive appraised they called upon Winslow, one of 's foremost dealers in financial history. “We believe PASS-CO will provide a service second to none,” said Winslow. Calling upon the services of numerous additional experts throughout the manuscript field PASS-CO provides a variety of service levels in the authentication of items. 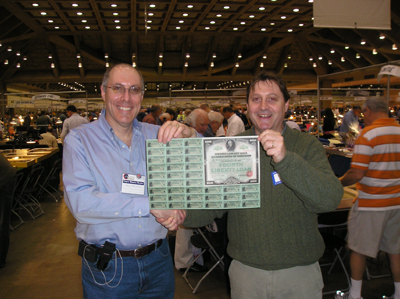 Through their joint efforts, PASS-CO has developed an image and reference archive of over 200,000 individual historic documents, autographs, signed photographs, historic Americana , and stocks and bonds which will rank among the largest such reference sources available to date for the detection of faked and forged signed materials. In addition, PASS-CO is engaged in developing a proprietary database of known forgeries and fakes which they believe will be among the finest in the industry. Individuals wishing to have their material authenticated can be assured that upon submission to PASS-CO, each item will be reviewed by a minimum of two PASS-CO experts. No other authentication service offers that assurance.